Dental implants are available in a range of materials. While the quality of your implant is the main factor in the pricing of these tooth replacement plans, the material used is extremely important to ensure successful implant placement. Titanium has been used in bone repair treatments for years, and it is highly biocompatible, making it the ideal material for implants. Titanium is still the most frequently recommend material. For patients who have allergies or sensitivities to metal, zirconia is becoming a very popular implant option. This quality solutions is also lighter in color, so you don’t have to worry about your implant showing when you smile. Because dental implant posts replace the lost root structures of teeth, the resultant restoration looks, feels, and functions more like your natural smile. The artificial root structure provides the necessary support for replacement teeth and offers stimulation to maintain jawbone density and gum tissue volume, preserving your full, healthy facial shape. By recreating the natural tooth structures, implant supported replacement teeth also improve overall oral health. They don’t rely on healthy oral structures for support like traditional replacements. Additionally, they help to preserve healthy gum and jawbone tissue more like your natural smile. For those patients who still have healthy teeth, this reduces risk for additional tooth loss. Most tooth replacement options will need to be replaced every five to ten years. Dental implants typically last two or more decades before they need to be repaired or replaced. Many patients keep the same implant supported replacement tooth for the rest of their lives. 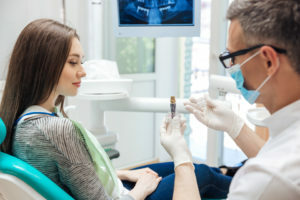 At Boston Smile Center of Brookline, Dr. Alan Sasson and his team are happy to offer quality, safe, and effective dental implant supported tooth replacement plans. Dr. Sasson has years of advanced training and experience providing oral Implantology services. Whether you’re missing a single tooth or your complete smile, our team will partner with you to create a treatment plan to fully renew your healthy, functional smile. Give our trusted implant dentist and dental care team a call today to schedule your tooth replacement consultation.